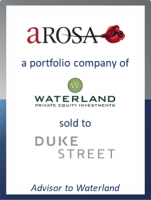 Duke Street will support the further growth of A-ROSA and strengthen its leading market position. Sascha Pfeiffer and Raiko Stelten of GCA Altium commented: "We are pleased to see our long-standing client Waterland Private Equity successfully exiting their investment in A-ROSA. At the same time we are convinced that Duke Street will be a great partner to foster the future growth of the A-ROSA river cruise group."